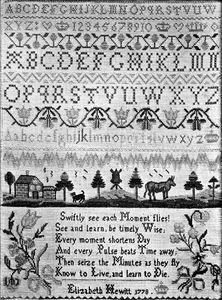 With the 18th century the style of the sampler changes. In shape the shorter and narrower type of the close of the 17th century prevails throughout the first quarter, but finds a rival in the plain square variety, which gradually supersedes it. Linen is still the chief substance em­ployed, but it is often yellower in colour, and in some cases a particularly virulent mustard tone appears. About the end of the first quarter a woollen canvas began to be used, and soon became almost universal. Towards the close of the century linen was again used and a certain kind of glazed gauze, known as " tiffany." Silk thread is mainly employed in the embroidery, but not metal, which entirely disappears and with it raised and padded work, while the colours of the silks are more vivid in the 18th than in the preceding century. The lace sampler vanishes, but in its place may occasionally be found samplers of " hollie-work." Holy- or hollie-work is a point-lace stitch, which derives the name from its monopoly by religious houses. This kind of work was much employed throughout the 18th century for baby-linen, caps and similar pieces of needlework. 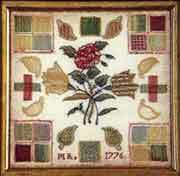 Mary Stroud's sampler (next picture), dated 1727, is an early and very perfect example of its kind. 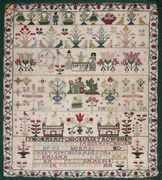 The decoration of the sampler in the 18th century is a much more elaborate affair than in the previous century. Early on in the period the border begins to appear, first as the edging to the pictorial panel, then as a more definite border , then in its completed form (next picture). When lam dead and laid in grave and all my bones are rotten, By this I may remembered be, when I should be forgotten. During the early part of the century the interest in lettering was so great that samplers are met with in which the decoration consists entirely in verses and inscriptions embroidered with a view to displaing alphabetical elaboration . In the design a more pictorial effect is aimed at, houses, fruit trees, pots of flowers, birds, the seamstresses' family , genealogical trees, the Ten Commandments, the Lord's Prayer, angels, being all employed to vary the composition. A favourite decoration in the 18th century is a row of coronets, representing the various aristocratic ranks. About the end of the first quarter of the century a band of landscape was introduced at the foot of the sampler, which remained popular throughout the century , being usually employed at the bottom, but sometimes in the middle of the design. The name of the seamstress and her age is almost invariably given and in many cases the school is also shown, a very early instance being that of Elizabeth Clements , who at the tender age of six, worked her sampler in 1712 at the foundling school of St. Clement Danes. The penalties that awaited her, if she neglected her task, are only too plainly mentioned. Epistle samples are occasionally met with, the earliest example known being from a small girl at Wanstead in 1693 . About the middle of the century darning samplers, which are worked on the sampler or on squares previously cut away, began to be popular and continued in favour till the middle of the 19th century. In the earlier examples the delicacy and variety of the needlework is considerable, the back being often indistinguishable from the front. 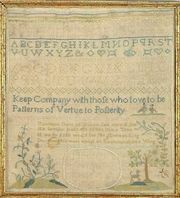 Sarah Everitt's sampler (next), dated 1777, is a par­ticularly fine example. Towards the close of the century some very small samplers were made, and a recurrence of the popularity of black-work is noteworthy. M. Quertier's sampler, dated 1799 , is a good example of the latter, and Lucy Titehall's, with its admirable sentiments , of the former. 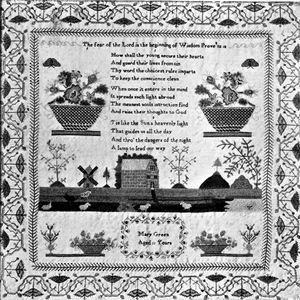 In the last quarter are also to be found the map samplers, on which the seamstresses' native village may sometimes be distinguished by the large size of letters, in which it is shown, or by its outlandish name among many familiar ones.These map-samplers were nearly all made within ten years of I790 but a few earlier examples are known, one pair dated as early as 1726. A few rare and unusual samplers are illustrated. 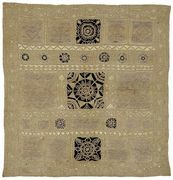 Mary Caney's sampler , dated 1710, is a pattern for knotting, and is worked in two shades of cream-coloured silk on a white ground. 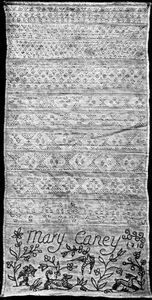 A. sampler , dated 1746, stands alone for shape, and is peculiar in that it reproduces 17th-century patterns in 18th-century colours. 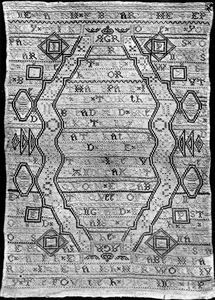 Catherine Benskin's sampler , dated 1754, is a very late survival of the 17th-century type. With the 19th century a marked deterioration of ideas sets in. Designs are, for the most part, stereotyped, a favourite form of decoration consisting of a strawberry border, always popular in the late 18th and early 19th century, a house in the centre, and verses decorously written and fitted into the composition . Another favourite design has stiff pots of flowers and small devices scattered over the ground . This dissemination of the pattern is particularly noticeable in 19th-century samplers, in which the sense of design is strikingly inferior to that of the previous century. 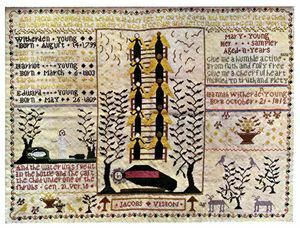 Sometimes there are amusing patterns, such as those on Mary Young's sampler, in which the angels in bottle-green high-waisted frocks ascend their ladder in a very restrained and dignified manner, while below a more than life-size Jacob reclines in sleep. But such are difficult to find, and an almost universal convention ruled over our great-grandmothers with a rod of iron. 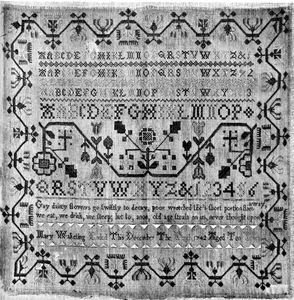 During the 19th century the cross-stitch was used practically to the exclusion of every other kind, and came to be known as sampler stitch. Darning-samplers continued to be popular, but are much coarser than in the previous century . 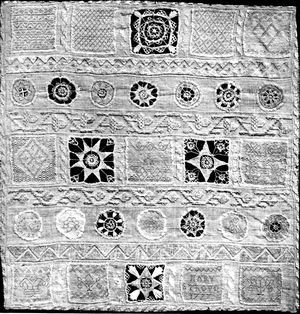 The sampler, generally speaking, died out about 1850, but a certain type is occa­sionally found at a later date. This type, which is easily recognised, consists of rows of letters of every kind and number set very close together, while at the bottom a medley of small devices, names and numbers, forms a kind of ornamental border . These samplers are worked in red silk or cotton and were apparently made at charity schools. Some are found with the Bristol Charity School's name on them, but the majority are unmarked. Though it does not follow that this type was made only at Bristol, it seems that the Miiller Orphanages there were the chief source of this class of work. Some years ago a lady in Derby acquired one of these samplers from a woman who had been brought up in those homes. The woman gave the information that all the girls there worked these samplers, but were not instructed, learning the patterns from each other. During the 19th century the sewing of samplers was part of the school curriculum, as may be seen by a little book called The Sampler, published in 1850. " The children," we read, " are divided into three classes. Every child, when she enters the school, is placed in the third class." The third-class sampler has back, chain, darning, besting, herring-bone, marking, overcast, button-hole and Oeillet-hole stitch upon it. When the child has practised these on the third-class sampler, she makes them accurately on the second-class sampler. 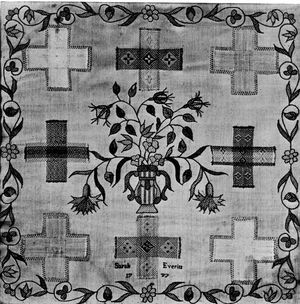 The first-class merely prepares for the lower classes, and does more elaborate work itself, such as the embroider­ing of garments for which the sampler provided the model.